Clearing your driveway from snow can be a huge production – unless you use the right piece of equipment, that is. 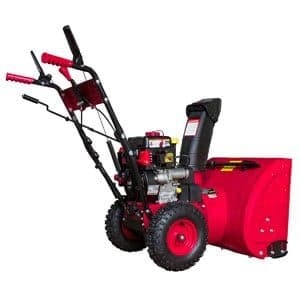 This is why if the idea of removing snow each winter season is something that you dread or is causing your so much stress, then you will find out best snow blowers in 2019 reviews a lifesaver in helping you select the right tool for the job. We have scoured the internet for the finest products that you can use for this labor-intensive task, so you can breathe easy and spare your body from unnecessary aches. Snow blowers are available in different types including the single-stage, two-stage, and three-stage. Among the three, the single-stage model is the lightest and easiest to operate. 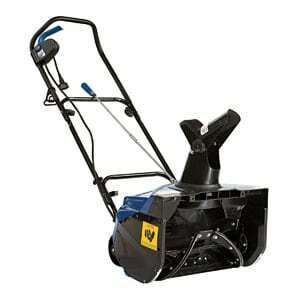 If you need to clear an average-sized area with 8 inches or less snowfall, then this is the right option for you. However, if there is more to clear, a two-stage snow blower is ideal as it is designed for a large and uneven terrain. For a much even faster snow removal, the three-stage is your best choice as it can move snow 10 times quicker than the two-stage ones. So, before you purchase a snow blower, you should consider the amount of snow to be cleared, the area you will work on, and the type of terrain. These basic aspects can lead you towards an excellent purchasing decision that will minimize the level of stress you deal with when the winter months come. Here are our best snow blowers in 2019 reviews, highlighting the key features and some points to consider with each item. Take your pick from our list below and get the best bang for your buck that you truly deserve. If your walkway and driveway are a mess during winter, then this piece of equipment may be just what fits the bill. 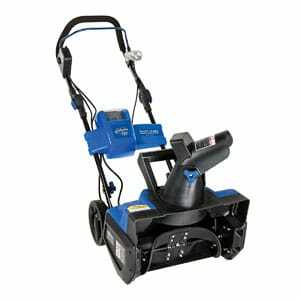 The Snow Joe Ultra Electric snow thrower SJ621 is a heavy duty machine that comes with a powerful motor to move as much as 650 pounds of snow in one minute. It comes with a 4-blade rotor made from industry-strength steel, which can cut snow with a width of 18 inches and a depth of 10 inches in a single pass. This is why in an hour, you can clear a large area of 2150 square feet using this tool. With a chute deflector, it is efficient to adjust the snow stream’s height for your convenience. The blower does its job well when it comes to moving deep and heavy snow. But keep in mind that this does not have powered wheels, which means you will need to push the blower manually with each pass. While this tool does not make the job effortless, it is indeed a smarter alternative to the traditional way of moving and removing snow. With this unit, there is no need to deal with an annoying cord that seems to be chasing you around and limiting the area you can clear of snow. 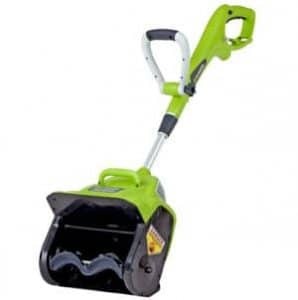 It includes a 40-volt Li-Ion rechargeable battery that is more than enough to finish the job of uninterrupted 50 minutes of snow removal. Only a single push of a power button is what you need to get started, and you will find it easy to manipulate because of the adjustable handle. There are 2 rubber blades included for moving as much as 495 pounds of snow a minute, and these components can clear an 18-inch wide and 8-inch deep path with every pass. Lastly, there is a built-in LED headlight for greater visibility in low-light conditions. It is true that the handle is adjustable, but it feels somewhat flimsy and not very sturdy because there is only one U-shaped fastener instead of two. Moving it along the driveway and sidewalk is not too efficient, either. Toro is a bit of a household name when it comes to snow blowers, so it is not surprising that this product has made it to our list. The Toro 1800 is capable of moving heavy snow in an efficient manner whether it is on the driveway, deck, or patio. The zip deflector lets you choose from different snow-throwing options such as high, in-between, or low, and the 160-degree chute lets you manipulate the snow discharge according to your preferred direction. Just a single pass makes it possible to clear an 18-inch wide path of as much as 12 inches depth of snow. Maneuvering this tool is also easy as it is relatively portable at 25 pounds, along with an ergonomic handle for better leverage. 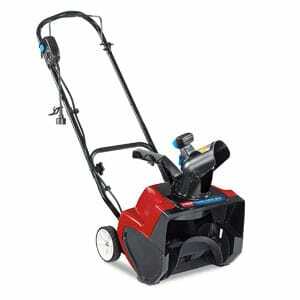 Overall, this is an ever-reliable snow blower that you can use in your driveway or outdoor space. The controls are easy to activate, and it features a compact storage design as the handle can be folded to reduce the amount of space this tool takes up in your shed. 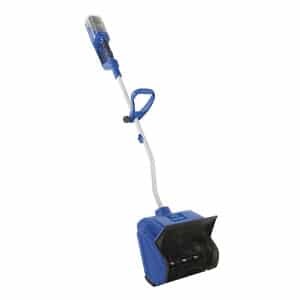 Snow snoveling the traditional way is a thing of the past, thanks to this ultra electric snow thrower from Snow Joe. It is a breeze to use and comes with a robust motor that lets you move 650 pounds of snow in a minute. This powerful piece of equipment is what you need for clearing a vast space of 2450 square feet in an hour, and it has a discharge chute with an adjustable feature to let you control the direction of the snow stream. We like how lightweight this tool is, not to mention the speed in throwing snow as compared to what some gas blowers can offer. 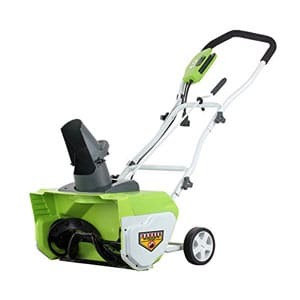 It is truly an easy to use snow thrower that offers the best value for your dollar. Just keep in mind that in the event of a heavy storm, this tool may have its limitations. The throwing distance also decreases when you need to remove heavy snow, so this is something to think about before purchasing this unit. 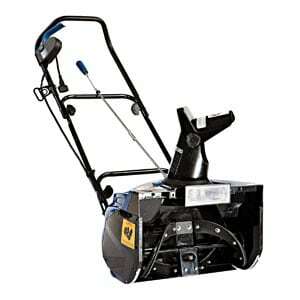 Get a larger amount of snow removed from your walkway with this two-stage snow thrower. It comes with an electric start, drive speed, and a remote efficient chute direction control. As this is an ultra powerful snow moving tool, it features an impressive clearing width of 24 inches with a clearing depth of 20 inches. Also, it has adjustable skid shoes, and this lets you alter the scraper’s height whenever you use this tool on various surfaces. Activating the speeds is also a breeze with just a shift of the lever. We like how this tool works on wet or even fluffy snow. However, if there is ice in the snow, this may eventually jam the machine. So, it is best that you go as easy as you can whenever you push into deeper snow. A lightweight and easy-to-maneuver snow blower from Toro, this model has a curved rotor to ensure a more efficient power-to-width ratio. It weighs 25 pounds for ease in maneuvering the unit, along with a Qwik-Key start for your convenience. A single pass lets you clear a 15-inch wide path and with a maximum of 1 inches deep snow. Once you are done with your task, just fold the handle up and store the unit without a hassle – perfect for small storage sheds. It is without a doubt a lightweight and maneuverable snow blower. However, the amount of power it generates may not suffice for heavier snow throwing tasks. But if all you need is a blower for light snow, then this product is good enough for you. Never again will you have to deal with dragging any cord along while you move snow using this unit. This features a 40-volt Li-Ion rechargeable battery that should be good for 52 minutes on a single charge. It comes with a 500-watt brushless motor for an enhanced battery efficiency, along with the power to move up to 300 pounds of snow a minute. The motor also reduces the amount of vibration and noise, which help extend the life and performance of the unit. We like how this powerful tool has a clearing width of 13 inches and a depth of 6 inches, while at the same time throwing snow to a distance of 25 feet. But you may notice the handle has a tendency to shift a bit during heavy use of the machine. Whenever your walkways are filled and blocked with snow, this tool is all you need to get these areas cleared of these obstructions. With a 13-amp motor, you can count on this tool to throw snow at a distance of 30 feet. It features a clearing width of 18 inches wide and a depth of 9 inches. You can also select the perfect height that works for you using the adjustable 3-position handlebar. 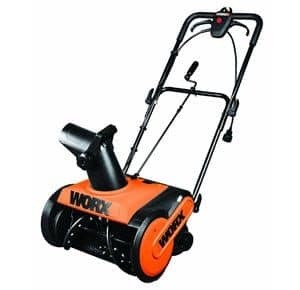 It is a lightweight and compact machine that does not take up much room in your shed. For a much better experience when using this tool, it is best that you use an extension cord ideal for the unit’s amperage such as a 12 gauge that can handle 12 amps. You should also make it a point to bring the unit inside to melt the trapped snow as this will prevent moisture from getting into the mechanisms of the equipment. Clear as much as 20 inches of an area filled with snow using this tool, which allows you to get the tough task completed without any hassle. This tool also features an 180-degree rotating radius, which lets you select the direction where you want to throw the snow away. With a heavy duty blade made from rubber-molded steel, durability and clearing performance are enhanced. Among the other features, we like about this product include the one-touch button to start the unit and the 6-inch mobile wheels for maneuverability. For its price, we have no complaints about the performance of this machine. A minor concern, though, is with the cord because it has a tendency to get in the way at times. For a kind of task where you need to deal with the impact of mild snow storms, then this unit is for you. It has a 10-inch impeller that can throw snow up to 300 pounds per minute with a maximum discharge distance of 20 feet. The clearing width is good enough for a small patio or driveway, which is 12 inches, and the clearing depth is at 4 inches. This tool is a smart alternative to shoveling snow the conventional way, particular if you have to deal with quite a certain amount of it. 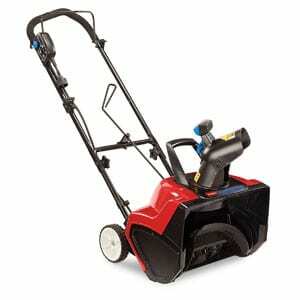 We are satisfied with how this snow blower performs on the light amount of snow up to 4 or even 5 inches deep. However, for heavy and wet snow beyond this depth, you may find this tool insufficient for this kind of condition. When buying the right kind of snow blower, there are essential aspects to consider to make sure you have no regrets with your purchase. 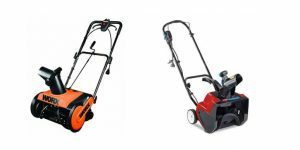 We hope that after reading our best snow blowers in 2019 reviews, we were able to assist you in selecting the perfect product for your specific requirements.